The radio is full with reports that President Obama is coming to the Bay Area, and will be landing at SFO in a few minutes. Normally, he's landing at Moffett Field in Mountain View. Oh yeah! 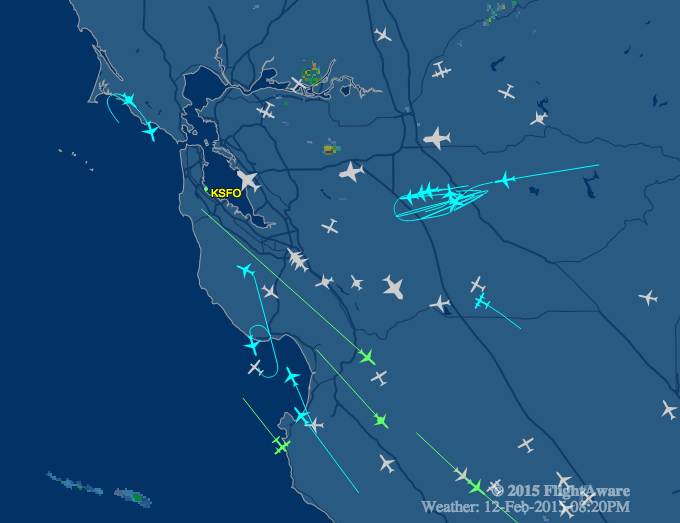 Look at all those planes circling above the Central Valley, ... and above Point Reyes, ... and above the Monterey Bay. There's a heavy flight landing at Oakland right now (the popup doesn't show in the screen shoot: it's a FedEx MD11 from Memphis), and the lined up incoming flights to San Jose at the south end of Silicon Valley are easy to see, too.